Rabbits dine out all year. They are herbivores and can make a quick meal of your garden. They will devour tender shoots in spring and gnaw through bark in the winter. You can tell when rabbits, not deer, have been chewing on your woody plants because rabbits make clean cuts. Deer do not have teeth on the top front of their mouths and must tear off the plants they munch on, leaving ragged stems. 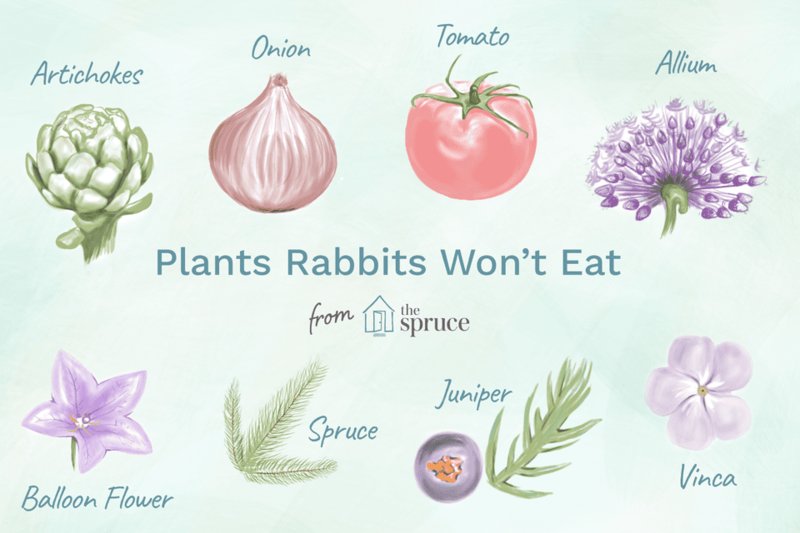 It would be nice if there were plants that are truly rabbit-proof, but as with other animals, rabbits can surprise you. They do have their favorite foods and those they tend to avoid, but when food is scarce, they will eat just about anything. If you are interested in how to deter rabbits, there are ways to control and deter rabbits from overrunning your garden. The entire list of plants that rabbits will eat, or at least sample, is too long to list out everything, the following are rabbit favorites. Tender, young leaves are the most susceptible, although they will sample many plants in the vegetable garden. These plants often sustain the most damage, because they are tender and generally out in the open with no protection. Rabbits prefer tender woody plants with thin bark, so new plants and shoots are at the most risk. If you have a shrub they keep gnawing on and you cannot protect it, tossing a branch or two on the ground might keep them content enough to leave the shrub alone. Rabbits will go for the easy meal. It is better to sacrifice a couple of branches than the whole plant. It should be no surprise that plants with strong fragrance or fuzzy leaves like lavender and black-eyed Susan are less popular with rabbits. Unfortunately, these plants will not deter them completely. Rabbits grazing in your flower beds will simply eat around the less enticing plants. These tend to be either aromatic, thorny, or members of the nightshade family. Remember, they may nibble to see if they like it and will eat anything, if they are really hungry.